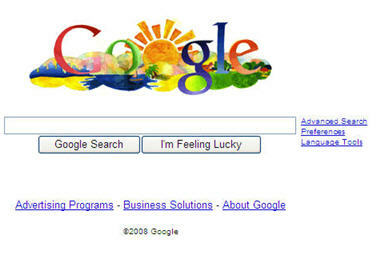 I posted this article last week about the Doodle 4 Google contest, and today is the day that the winner appears on the www.google.com home page. Congratulations to Grace Moon, a 6th grader from California, whose vision of a world that’s “clean and fresh” where “people are social and enlightened” won first prize. This entry was posted on Thursday, May 22nd, 2008 at 5:36 pm	and is filed under Google, Play. You can follow any responses to this entry through the RSS 2.0 feed. Both comments and pings are currently closed. I was wondering who made this version of the Google logo when I saw it today. There was something.. different about it. Thanks.